I am doing things a little differently today. Instead of sharing the top three most viewed links from last week's party I am sharing the top six. Why, you ask? Well, because I am up to my eyeballs in Christmas mess all over my house and after enjoying family time during the holiday I have not had time to go through last week's links to choose features for this week's party. My bad. This time life got in the way. So let's look at the top six most viewed. 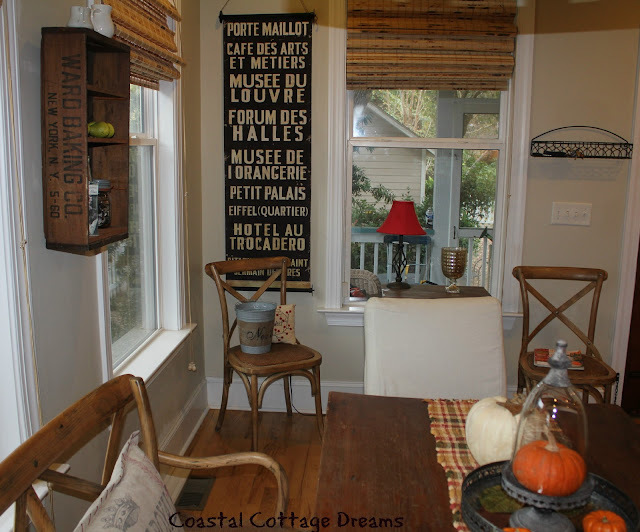 First up with over 288 views is Coastal Cottage Dreams who shared how she added texture with new blinds in her dining room. 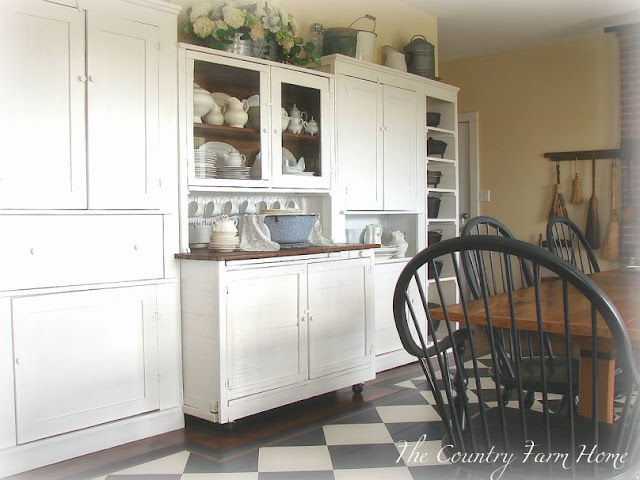 Second, with 257 views is this wonderful farm house keeping room by The Country Farm Home. My friend, Shirley, from Housepitality Designs was third with 250 views by sharing her new cute little table that she added to her kitchen. 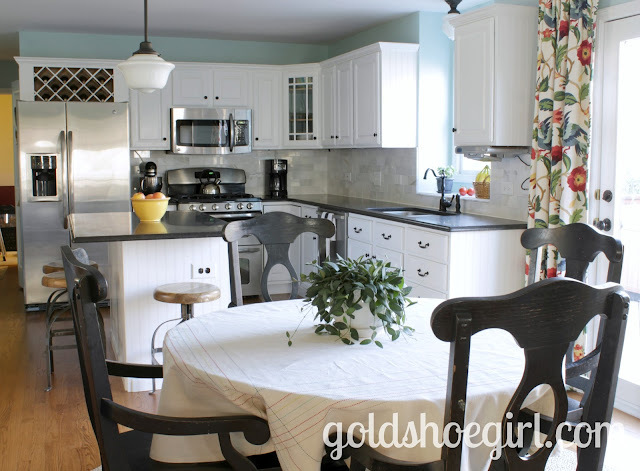 This fabulous kitchen reveal came in fourth with 240 views. Check it out at Gold Shoe Girl. Fifth is Looks Like White who shared a fabulous Edwardian Cottage and had over 239 views. And sixth is Stone Gable with over 233 views sharing her lovely winter mantel. All of these are fabulous. Y'all can grab a featured button from my sidebar. I have been a bad blogger lately and haven't had time to do much blog visiting and commenting. I hope to get back in a normal swing soon. Hope you understand. Well, back to Christmas decorating so I can clean up and get to where we can walk in here again. See you tonight for Wow. 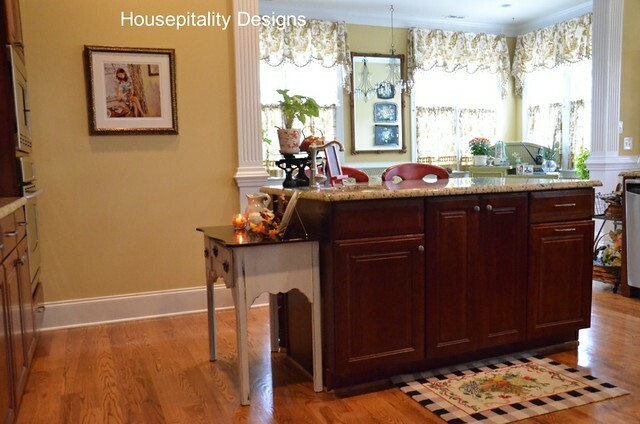 Great features from last week's "Wow"...and speaking of "Wow", I love your touches on holly on your header!...thanks for featuring my kitchen island "enhancement"...I am surprised and honored to be number three! !...Happy decorating!!! I love that you did six because with all the holiday craziness, I didn't have time to see many last week! Have fun decorating! Loved all the features from last week.....give yourself a break girl, its okay to enjoy your life!!! I think we're all in the same boat as far as getting around to everyone we want to visit. You do an amazing job keeping up with it all, Kim! I always appreciate all you do! Goodness, Kim... I feel like "I've arrived"! I am in such wonderful company!!! See you tonight! They are all great features but it was the Country Farm Home that stole my heart! Love that mantle - my house is a mess too! Boxes of Christmas decorations everywhere! And I work full time and have an injured foot so the decorating is going slow. Being out of town for Thanksgiving and then out of town again next weekend isn't helping - but the family times are fun! I am in the same up to my eyeballs in glitter and ornaments boat! Glad you're taking time to enjoy your family too. I hear you about being busy! Why I decide to do big projects around the holidays is beyond me! I had to do a couple posts that peek at our master bedroom/bathroom. Not sure either are worthy of WOW us Wednesday! Glad your getting those Christmas decorations going. Can't wait to see what you come up with this year! Don't apologize for being busy! I am glad you are normal. Great features. This is the season to enjoy family and friends, decorating and cooking, love and joy! No need for an apology! Such a beautiful photo with the light coming through the shutters. Gorgeous features every one! Love Stone Gables Mantel. I've decided I can't seem to get back to being a good blogger...every time I get things rolling along again, life steps in and either has me too busy, too stressed or too sick to put blogging very high on the list. I have great hope to get things back to some type of normal after Christmas! I went a different way with my decorations this year (so far only 1 post) but, it was much easier and required about 40 less boxes being dragged up the stairs and back down. I think I love it!